For I will pour out water to quench your thirst and to irrigate your parched fields. And I will pour out my Spirit on your descendants, and my blessing on your children. They will thrive like watered grass, like willows on a riverbank. Daddy built the pool when I was 18 months old. I am told when they opened it that both Kathy and Meadors learned how to swim that day. They, and every other kid in the family had stayed in that cold water all day long, and when our parents took their orange life jackets off, they both could swim. I remember those orange canvas lifejackets, with their white web straps that encircled your waist and threaded between your legs to keep you from slipping out the bottom. Those lifejackets were heavy and soggy and would rub your chin raw as you bobbed up and down, up and down in the waves. Because there were always waves in that pool. It was filled with kids splashing each other, having races on inner-tubes, cannonballing off the diving board. Lynn and Maryann and Jane would beg their mother to come over every afternoon, and Doris would promise she would call Pauline and see if it was alright – after they got their chores done. 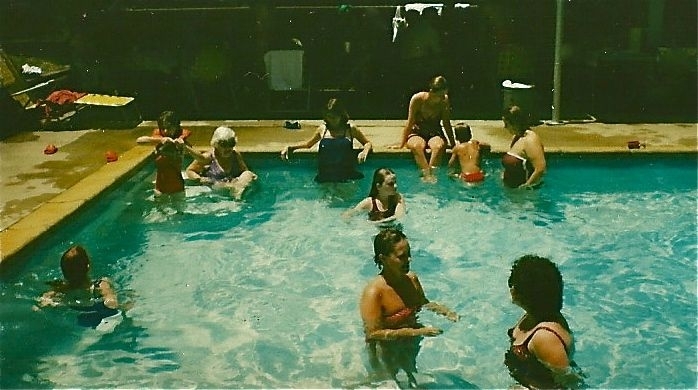 The Cunninghams populated the pool during the week, as well as the Morris’s from across the road. And the Tanners were there on the weekends. Making churns of ice cream for supper. Spitting watermelon seeds over the fence. Joel and Nancy and I, the youngest, dancing to Elvis Presley. Summer was the pool and its blue water. Children swimming, bats swooping down at night to drink, frogs trying to plop in un-noticed. This water was symbolic of so much my parents passed down to me. We kids not only played in it, we ‘baptized’ each other in it. Our great-grandparents had helped form Rock Hill Baptist Church, just down the road, across the fields and through the woods. Many of us knew that one day we, too, would make a decision to follow Jesus, and would do what He did; be washed clean. Baptized – old life dead, new life begins. I don’t know when it all started for my family: I only know it is all I have ever known. My parents, my grandparents, and those who came before; giving land for a church, sitting in the ‘Amen’ corner, the widows in the front with their black hats and powdery skin. There was a rift for a while in the church when my mother was young, so my grandmother took her 8 children to White Oak Baptist Church until things settled down. It was then, as a child, that my mother made her decision, and just happened to be baptized at the same time as my daddy – who was a year younger than her, so she didn’t pay him too much attention. As the years went by, my mother, a recent widow, moved back to town with her two small daughters. It was the widows of White Oak, who started pestering my Daddy, a deacon, (and who was yet to become my daddy) that Pauline was back in town and “she sure was pretty”. He laughed when he told me the story: he would either have to ask my mother out or stop going to church. He asked her out. They married. They had me. And built a pool. And Nancy was born (who learned to swim at 18 months!) and our little family became six. We grew up going to church every Sunday and Wednesday at Rock Hill, which changed its name to East North Street. And that was pretty much life for us. Water was the legacy they handed down to us. Water in our back yard. Water in the church baptismal. Question: Does your family follow a tradition of baptism? What does that mean to you? New Living Translation (NLT) Holy Bible, New Living Translation, copyright © 1996, 2004, 2015 by Tyndale House Foundation. Used by permission of Tyndale House Publishers, Inc., Carol Stream, Illinois 60188. All rights reserved. So Why in the World did God Create that?